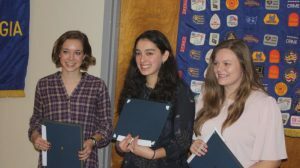 The Exchange Club of Rome recently held their annual Speech Contest. There were three students who presented excellently prepared and delivered speeches. The speeches were between five and eight minutes and had either an Americanism or Patriotic theme. The contestants were Caroline Young from Rome High School, Gracie Hall from Pepperell High School, and Kayla Hutcherson from Armuchee High School. Judges were Delmas Franklin, Jr, John Pillsbury, and Elaine Price. Barbara Carter was the time keeper. The winner was Caroline Young from Rome High. All three students received a check from Rome Exchange for their participation in this event.